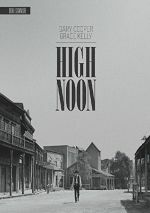 In 1873, on the Gold Trail, Montana, the mysterious and controlling Dr. Joseph Frail arrives in the small town of Skull Creek with miners in a gold rush. A Western based on a novel by Dorothy Johnson, 1959’s The Hanging Tree takes us to the remote territory of Skull Creek Montana circa 1873. Miners participate in the “gold rush”, and Dr. Joseph Frail (Gary Cooper) arrives with hopes that he can ply his trade there. Frail meets Rune (Ben Piazza), a young man accused of a crime for which the locals want to hang him. Frail protects Rune but also attempts to manipulate the situation for his own benefit, as he forces Rune to become his manservant. Other aspects of Frail’s dark past come to haunt him as well, and the introduction of pretty stranger Elizabeth Mahler (Maria Schell) complicates the situation. Throughout his career, Cooper usually played noble “good guys” like earnest Sheriff Kane from High Noon. Going into Tree, I assumed he’d take on a similar part, with Frail as the upstanding citizen who battles against vengeance-hungry citizens. Frail offers a more complex character than that, mainly in the way Frail deals with Rune and Elizabeth. For instance, does Frail protect Elizabeth out of her own interests or because he wants her all to himself? In the end, it doesn’t really matter, as Tree loses focus along the way. Though we get a good first act and a lot of potential, the end result fizzles as it goes. That seems like a disappointment, as I do really like the movie’s set-up. We get real intrigue related to Frail and the others, as Tree lets them seem more complicated than I’d expect from the genre. Once Elizabeth enters the picture, though, matters tend to simplify. She becomes the object of affection for some of the men, and this sends the movie down fairly trite paths. Tree also ignores its lead too much of the time. While Frail plays a prominent role for the movie’s first half, he fades into the background along the way – until the story needs him again at the end. These choices give Tree an oddly spotty feel, as if the filmmakers couldn’t decide what character or narrative threads to pursue. Frail also leans back toward the more traditional “Gary Cooper character” as it moves. Frail largely loses the darkness and nuance of the first act to become little more than another noble hero. 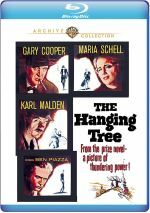 The Hanging Tree appears in an aspect ratio of approximately 1.78:1 on this Blu-ray Disc. Across the board, this was a pleasing image. Sharpness was strong. Virtually no softness materialized here, as even wide shots showed nice clarity and accuracy. I saw no jagged edges or shimmering, and edge haloes remained absent. With a nice layer of grain, the transfer showed no signs of intrusive noise reduction, and print flaws failed to appear. Colors appeared positive. The movie went with a fairly rustic palette that favored browns and reds, all of which seemed broad and rich. Blacks were deep and firm, while shadows showed good clarity and delineation. This was a consistently fine presentation. As for the film’s DTS-HD MA monaural mix, it seemed dated but decent. Speech was a bit thin but remained intelligible and concise. The lines lacked edginess or notable flaws. Music showed reasonable clarity but not much range, and effects followed suit. While those elements appeared clean enough, they didn’t display a lot of heft or power. That wasn’t a surprise given the movie’s vintage, though, so this ended up as a satisfactory track for an older film. The disc includes the film’s trailer but lacks any other extras. For its first act, The Hanging Tree promises to bring us a complex, nuanced Western. Though it remains interesting, it loses those shades of gray as it goes, factors that make it inconsistent. The Blu-ray offers terrific picture quality as well as age-appropriate audio but it lacks supplements. This turns into a decent but erratic Western.